Anne-Marie Faiola provides 31 easy-to-follow recipes for crafting a variety of bar soaps with great color, shape, and texture. 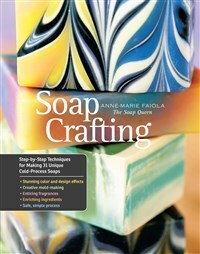 Anne-Marie Faiola is the author of Milk Soaps, Pure Soapmaking, and Soap Crafting. She is the owner of Bramble Berry, a company that sells soapmaking supplies at www.brambleberry.com, and offers soapmaking advice and inspiration through her blog and on her YouTube channel, Soap Queen TV. The recipient of several small business awards, Faiola was named a Best Boss in America by Fortune Small Business, and is a member of the Coalition of Handcrafted Entrepreneurs (COHE). She can be found online at www.anne-mariefaiola.com.